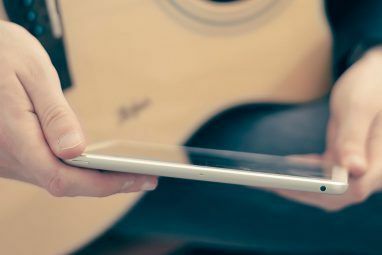 In this article, I’m going to outline some of the top resources that I use to find guitar chords for songs that I want to learn how to play. Recently, I decided that I needed a way to relax and get rid of stress – something that is somehow unconnected with the computer. I remembered playing around with my mother’s old guitar when I was a kid, and realized that I’ve always wanted to learn how to play guitar. My daughter was already taking piano lessons from a local older couple who give lessons, so I decided to take guitar lessons while waiting for my daughter to finish her piano lessons. Within three lessons, I found myself playing a John Denver song using just three chords. Of course, I was immediately hooked. Practicing every night, I’ve mastered the song in about a month. However, once I was able to play the one song, I wondered how many others I could learn that use just those three or four chords. So, a hobby that I took on in order to get off of the computer and take a break from the Internet, ended up bringing me back to the Internet in search of guitar chords for songs that I really want to learn how to play. 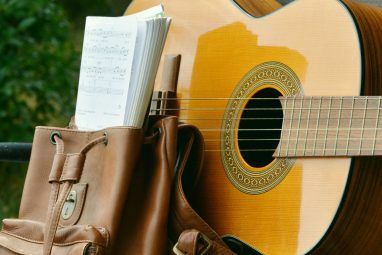 I’ve found a few excellent websites that do a tremendous job in cataloging the correct chords for the most popular traditional and contemporary songs. Today, I’d like to share those discoveries with other guitar players out there. I think Chordie has to be one of the largest collections of guitar chords and tabs that I’ve ever found. I’ve yet to think of a song that doesn’t have a corresponding Chordie listing. At Chordie, you can search for either song or artist listings that are organized in a long alphabetical collection. This way, if you don’t know the title of a song, you can search for the guitar chords by the artist name instead. Chordie is actually a huge community of guitar players who love music so much that they spend time trying to figure out the chords to music, and then list their findings on Chordie. 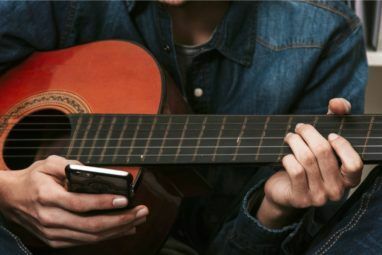 Most of the time, you’ll discover that the chords listed here are actually pretty accurate – and you’ll be playing the coolest songs in no time. If you can’t find guitar chords for songs that you’re looking for anywhere else, then I’d suggest going to Chordie as your last resort. Why as a last resort? Because at least half the time, you’ll also discover that members posted chords or lyrics that are just totally wrong. For example, one of the first songs I tried to learn on my own was Losing My Religion, by R.E.M. I found that the chords seem correct, but the lyrics are completely messed up. Some sentences are completely wrong, and others are just plain silly. This is only representative of about a third of Chordie chord listings from members – most of them are pretty accurate. The best part of Chordie listings is that the chord is displayed at the upper right hand corner, so you don’t have to go flipping through your guitar book to remind yourself how to play an “F”. Although I started out using Chordie, I got frustrated looking for accurate contemporary songs, so I was very pleased to stumble across Ultimate Guitar. The first thing you’ll notice when you arrive is that the layout is very clean and very cool. There’s music news, reviews, articles and interviews. You’ll find a forum and a full community of guitar playing music lovers just like you. This is seriously a huge community where you can not only discover the guitar chords for songs, but you can absolutely immerse yourself into the world of music as you’re learning to play new songs. My favorite section of the site is the Top 100, where you’ll discover some of the greatest songs that you hear on the radio and wish that you could learn how to play. Another thing I like about this site is that in most cases you’ll find both the chords and the tabs. Many self-taught guitar players like tabs because it shows which string and which fret to play for each strum. However, taking lessons I’ve learned the chords, so really prefer just the lyrics with the chord changes listed above. Luckily, at Ultimate Guitar you’ll find both. 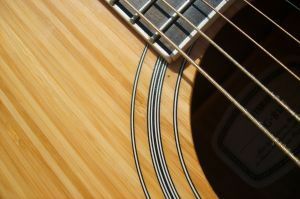 While my favorite online sport for popular guitar chords is Ultimate Guitar, E-Chords is a very close second. I love how functional the site is. From the main page, you’ll discover that you can search for songs by artists, albums, composers, song titles and even using just part of the lyrics, which is very useful when you just can’t remember the title of a song. This site isn’t so much as community as it is an awesome online application that helps you learn how to play any song using whatever format you’re most comfortable with. The coolest part of e-chords is how you can customize the display of the song and the associated chords with a click of the mouse. The guitar chords for songs that you’ll find here are displayed exactly how I like them – the lyrics with the required chord listed above them. The menu bar on the left offers all kinds of cool features, including auto-scroll (really nice when you’re trying to play and need to scroll down for the lyrics! ), increase or decrease the font size, hide chords, play simpler chords (if available) and even switch the chord display from the letter to the chord drawings (awesome for beginners). Overall, I’d have to say that guitar chords for songs that I want are at e-chords, then this is where I prefer playing them because it’s so convenient and easy to use. While Heartwood Guitar isn’t a giant library of thousands of guitar chords for songs, it is a place that you’ll want to go for some amazing free resources to learn how to play the guitar – with a hundred or so great classic songs, including the chords you’ll need to know to play them. Major kudos to Rob Hampton of Seattle for creating this impressive and useful online resource. To find the chords, from his main site just click on Chord Charts. You’ll find hundreds of great songs listed alphabetically. These chord listings are nicely laid out with strum and rhythm information noted throughout in some spots. Now, while the chord listings are really fun to go through and play, I have to say that my favorite part of this website are the guitar lessons that Rob has written up and that he offers for absolutely free on his blog. On his blog, he’ll show you tips and techniques on how to strum, tuning your guitar, fingerpicking and much more – often including images and always including detailed and clear instruction. It’s obvious that this is one instructor who is an excellent teacher, and that he really loves the art of guitar playing. Are you learning to play guitar, or are you an old pro on the strings? Do you have your own personal favorite online resources for finding accurate guitar chords for your favorite songs? Share your own resources in the comments section below. I first want to get used to you then maybe I will send some own creativity for you to share. So let's get started.yeah. Ultimate Guitar used to be my 1st go-to, but it has since loaded it's web-site with so much spam, it's hardly useful anymore. I have resorted to Cut and Paste text from there to Word and use it that way. E-Chords.... Nice but hard to keep the pop up chords objects from populating the page. Still though. a great layout. Chordie... I have yet to use it, but Tonight.... Chordie will get my attension! The line of least resistance: Chordie. However, Google is a good starting point, often, for more complete or better tabs or chords. The current site would serve better by reviewing a larger number of tablature and chord sites. Interesting and useful selection, thanks! The great thing about E-Chords is it also gives piano chords, which are much harder to find than guitar chords/tab. If you wanna learn how to play guitar or just get better, you should definitely check justinguitar.com. Nice-easy to follow teacher, great free content and 100% accurate songs! Highly recommended. Some piece of advice: the best way to learn a song is by trying to transcribe it and not just search for the chords in the internet. I'm an ultimate-guitar man myself, I find it's got all the features I need, and a huge database. It also has auto scroll, and you can see the chord diagrams simply by hovering over the chord - it can also show you alternative versions. Best of all, it can automatically transpose chords to different keys, which saves me using a capo all the time. They also host Guitar Pro and Powertab files if you use them, showing you the timing of the notes. Powertab is my personal favourite, as it's free, although designing your own tab files is pretty tricky. Another site worth mentioning is 911tabs.com - it's a metasearch engine, so it has an even greater range than UG.